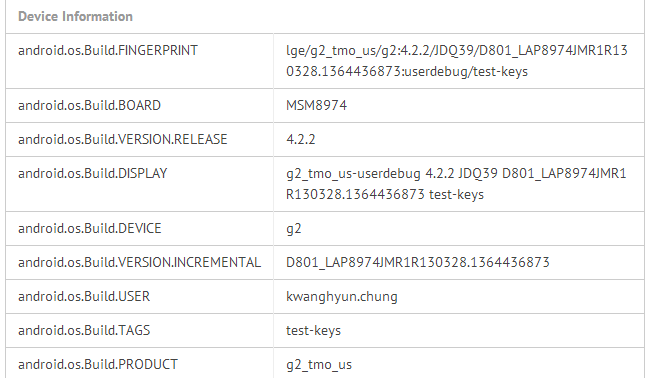 Benchmarks were recently filed through GL Benchmark that point directly towards the upcoming LG Optimus G2 for T-Mobile. Previously, we discussed this device for two main reasons – first that it would be launched possibly running Android 5.0 aka Key Lime Pie, and that it would come powered by Qualcomm’s Snapdragon 800 processor. Today, we can start the process of confirming at least one part of that, as the device has shown up as the LG D801, sporting the MSM8974 (800). Showing to have a max CPU frequency of just 1728, that is a bit slower (for lack of better term) than the 2.0GHz+ that was rumored a couple of months ago. A quad-core 1.7GHz chip is nothing to cry over though. Next up, the device that received the benchmark is shown as running Android 4.2.2, not Android 5.0. If it was running KLP before launch/announcement, that would be amazing to say the least. There is no launch date set for the Optimus G2, so it could still be that LG and T-Mobile are awaiting the arrival of Android 5.0 to move forward with the device. Either way, when the device does launch it will be one of 2013’s superphones, so you will most certainly want to keep an eye out for it.